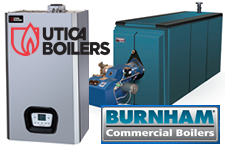 U.S. Boiler Company, manufacturer of Burnham brand products, has introduced more new, high efficiency products over the last several years than any other company at any time in the history of hydronic heating! From new ENERGY STAR certified, gas-fired residential boilers… to high efficiency oil-fired boilers including advanced design, three-pass, cast iron boilers… along with the industry’s only, three-pass, oil-fired, steam boiler… and the only atmospheric gas boiler made in America, the ES2, boasting 85% AFUE. Together, the expansive lineup of Burnham heating products boasts the highest average efficiency, exceeding 85%… with maximum efficiencies over 95%. And the ES2 and MPO-IQ have been recognized as Consumers Digest “Best Buy” award winners. Weil-McLain offers comfort solutions for various building types including single-family homes and apartment complexes to restaurants, hotels, casinos, warehouses and more. Where your project requires zone controls to vary room temperatures or equipment to help warm pools and spas, Weil-McLain heating and cooling solutions offer reliability and versatility. The Munchkin Boiler is one of the most compact and efficient residential boilers available on the market today. Each Munchkin Boiler will modulate its firing rate to match the energy needs of the living space. This feature provides additional savings versus traditional single firing heaters. With stainless steel construction, you can be assured that you are buying the highest quality appliance. Proven European technology, manufactured in the United States. A quiet operational appliance is just another benefit that comes with the Munchkin boiler. The Utica line of products are designed, tested and assembled to ensure that our customers get the very best in home heating comfort and value. The complete line of gas and oil-fired products has earned a reputation for exceptional quality, performance and dependability. Highest quality components, exceptional quality and testing standards are supplemented by a computerized process that tracks components to finished goods. ECR International’s highly trained and skilled workforce insures that Utica’s products and service are among the best in the industry. The Ultimate Series of Hot Water Boilers by ECR International combines versatility, efficiency and design to make it the ideal choice for heating comfort and reliability. The ULTIMATE Series features ENERGY STAR® rated efficiency of up to 87.6% A.F.U.E., and dramatically reduces fuel costs, providing an excellent return on your home heating investment. For more information visit www.uticaboilers.com, www.usboiler.net, www.weil-mclain.com, www.munchkinboiler.net or www.ultimateboiler.com.